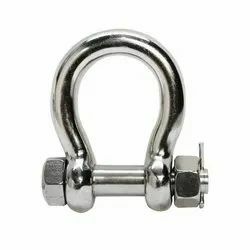 Prominent & Leading Manufacturer from Mumbai, we offer steel shackles. We are widely appreciated for manufacturing and supplying a broad array of Steel Shackles. Moreover, we manufacture these contemporary shackles by making use of the best grade raw material and modern machinery under the guidance of professionals. Shackles are u-shaped pieces of metal affixed with a pin or bolt across the opening to appropriately secure effective locking mechanism. Post production, we make these Shackles pass a quality check so as to ensure their Durability.